Toshiba WT200 008 - tablet - Windows 7 Professional 32-bit - 64 GB - 10.1"
Powered by Windows 7, this tablet delivers a better way to browse the Web, enjoy HD videos, play games, listen to music and more. Complete, convenient and customizable, it's everything a tablet can and should be, with a 10.1" diagonal high-res multi-touch LED backlit display, features you can personalize, and speedy performance so you can multitask your way through your digital life with ease. It offers seamless compatibility and runs the applications and software essentials for mobile users. The full range of ports and interfaces deliver desktop like connectivity and makes for quick and easy setup and disconnect for users on the go. Specifications are provided by the manufacturer. Refer to the manufacturer for an explanation of the print speed and other ratings. 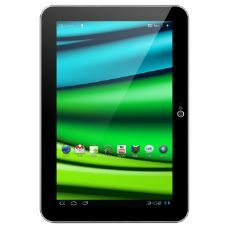 ViewSonic ViewPad E72 - tablet - Android 4.0 - 8 GB - 7"
Toshiba WT200 00E - tablet - Windows 7 Home Premium 32-bit - 64 GB - 10.1"
Toshiba Excite 13 AT330-005 - tablet - Android 4.0 - 64 GB - 13.3"
ViewSonic ViewPad 7e - tablet - Android 2.3 - 4 GB - 7"